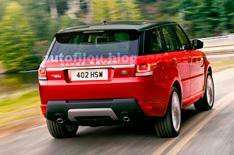 More Range Rover Sport pictures leaked | What Car? More images of the 2013 Range Rover Sport have appeared online ahead of its debut at the New York motor show. The new pictures appear to be official images and follow on from amateur shots of the Sport in a workshop that appeared two weeks ago. The official unveiling takes place this evening, ahead of its public debut at the New York motor show. The launch will feature a drive through the Manhattan district of New York, when Range Rover is expected to reveal more technical details on the car. Range Rover has previously told What Car? that the new car will come with five- and seven-seat versions for the first time and will share the bigger Range Rover's aluminium architecture and new engines, including the forthcoming diesel hybrid version. Engineers have also said that it will be more luxurious than the current model and feel more agile and 'car-like' to drive.